Prochaine animation en anglais pour la rentrée scolaire…Emmenez vos spécialités pour partager un repas entre amis et en parlant anglais of course. 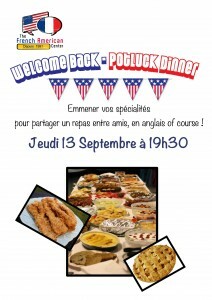 Le Potluck Dinner « spécial rentrée scolaire », c’est le Jeudi 13 Septembre à 19h30 au French American Center, 34000 Montpellier. Faites nous partager ce que vous allez emmené en laissant votre commentaire. Hello, I’m french and I want to meet english or american people to improve my english! Is the ptluck Dinner Free ? What type of food should we bring ? I discovered watermelon/feta/basil salad this summer. Gonna bring a bit of that! I will either be bringing carrot cake or muffins. Fingers crossed that they turn out well! I’m thinking…. black bean and corn relish… yum! Bring anything you are used to cooking and present it to us. Yes you can come to try it out and then you can join our center if you decide to. It’s free for our members. Just come along with your dish – see you there! I’ll try to cook some « eggplant caviar ». It should be edible. I will come with my daughter Lila and her friend Cyriane. We are discovering the french american center; we met you on sunday. I hope we will have a nice time togheter. Hi Laure, we look forward to meeting you, your daughter and Cyriane! Sylvain, that sounds a bit scary, but I’ll try anything (once)!! See you tomorrow night. I’m discovering the FAC because i would learn english. I met Jane the last week. This evening, i will bring « hoummus »,a chickpeas-based speciality. Hi, I migh be late. I had class until 5 I’m cooking a nuts cake. See you all!